Along the history of human civilization the sun has been the most visible entity that has commanded man’s awe gratitude reverence and worship. Most emerging religions of the world have drawn from this original source of inspiration. Just like the shared of time the rhythm of day and night the rotation of the seasons the sun will continue to illuminate and unite us as children of one supreme source. Science has recognized this great ball of fire and energy to be an exploding furnace of Helium and hydronge without which nothing on earth can thrive or survive. But beyond the physical harnessing of solar energy where the sun is the Godhead lies the final frontier of man’s destiny. Beyond the myths of Egypt Babylon Persia, and Peru beyond the antiquities of astrology lies the preordained tryst of mankind with its most original perception of divinity the light behind the sun the spirit within the fire the resplendent form of the benevolent mother of the universe who as we know her is Gayatri. To celebrate this great fortune and to bring it within the grasp of active consciousness we have the Gayatri gifted to us. The power to utter chant and contemplate it is our precious privilege. Traditionally Hindus have turned to the Gayatri mantra to develop intelligence knowledge and wisdom and to expand the consciousness Gayatri is taught to children at the age of eight when they enter the period of academic education. It helps in sharpening perception and attention enhancing retention and memory power leading to the growth in intelligence. 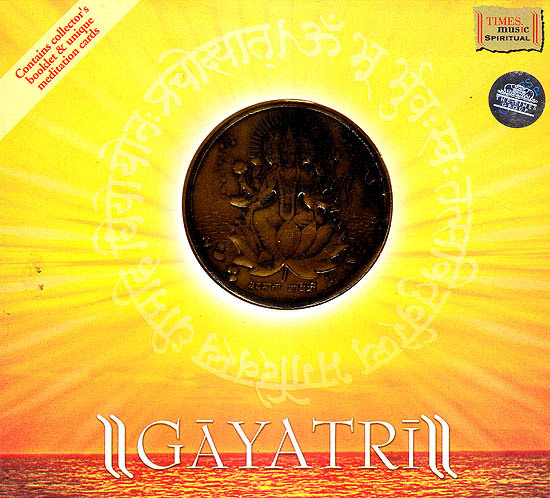 Hindu writings declare the Gayatri to be the highest mantra. In the Gita Lord Krishna endorses among all the chandas I’m Gayatri the jap of Gayatri is believe to bring the same fruit as the recitation of all the Vedas Gayatri is the very essence of the three holy Vedas Rig, Yajur and Saam. And the presiding deity of this meditation is the Parabrahman himself. It is conceived as worship of Devi or of Lord Vishnu or Aditya the sun and also of pune Nirgun worship of Brahman. The Vedas say Samano Mantrah which means that let one mantra be common to all. And that mantra is the Gayatri. The Tejas of the Brahmachari (Celibate) lies in his Gayatri Jap. The support and properity fo the Grihasth (householder) is again the Gayatri. The strength and solace of the Vanaprasth is again the Gayatri. Indeed Gayatri is an impregnable spiritual armour a veritable fortress that guards and protects its votary that transforms him into the Divine and blesses him with the brilliant light of the highest spiritual illumination. Just as the sun knows no difference in religion, gender, caste, creed or country just as it shines equally on all living beings the Gayatri Mantra without distinction invokes the power of the sun to energise all earthly life. It is a prayer to life’s source the sun to illuminate our intellects destroy our sins and guide us in the right direction. Gayatri mantra the most ancient and potent mantra of Hinduism helps the higher human to be born in us all. Just like the sun liquidates darkness Gayatri Mantra decimates ignorance. It illumines the intellect and produces the highest bliss creativity and success in the world. Rendered in the magical voice of Pandit Jasraj and Rattan Mohan Sharma this highest meditation mantra for illumination enables us to destroy our sins and reveal the supreme self us. Enlightening and energizing at the same time this celebration of the all pervading source of light is complimented by a collector’s booklet and unique meditation cards of rare beauty and value. Gayatri Sadhna Why and How?